Since it is such a slow Friday for me, I thought I'd put this out there. What shows have you dropped? and what shows are you still watching? 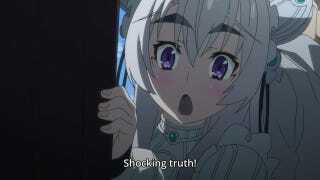 I'm still watching: 1) Coffin Princess Chaika - I think Chaika is the breakout character of this season. The show is well animated, has moments of good action, and is overall really fun to watch. 2) The World is Still Beautiful - Funny, sometimes melodramatic, but with some real heart. 3) No Game, No Life - interesting and entertaining, despite some distasteful fanservice, still keeps me coming back week after week. 4) Blade x Soul - Ok not for everyone, sort of tragic, but oddly not in a traumatizing way (if that makes sense), sort of spaghetti western in an eastern fantasy setting. 5) Irregular at Magic High School - sort of a guilty pleasure, I believe I still watch it just because it is really easy to watch. I don't have to be in a particular mood to tune in. 6) If Her Flag Breaks - I watch this only sporadically, but I think it is funny when I do. On Hold (I tried, though I intend to watch these when they are complete): 1)Brynhildr - yeah I had to stop about 4 episodes in since I'm rarely in the right mood to watch this, I consider it good but hard to watch. 2) Mekkaku City Actors - I'm a shaft fan, but I''m just going to wait until its done so I can try to absorb it all at once. Dropped: 1) Daimidaler - man I liked HS DxD but this is just really bad. 2)Black Bullet - had some promise and was well animated and good looking, but sort of unpleasant for me, I called it quits after the first arc. 3) Captain Earth - got about five episodes in then lost the urge to click the next one, I may revisit it if the reviews come in positive later on. Between new episodes, I've been fitting in some older series. Some cosplayers at ACEN convinced me to watch Ouran High School Host Club, and that series is turning out to be hilarious. I'm also about 1/3rd through Bodacious Space Pirates, which is surprisingly very well done. Lastly, I've been watching Durarara on pace with ani-club here, and that is excellent. JoJo, Date a Live and Soul Eater are on my queue next as I want to try to watch the older seasons before the newer seasons. How about everyone else, are there any series that people may have given up on too soon? Has anybody else been afflicted with an anime apathy towards the shows this season? I think I was watching about 12 shows a week last season. I sort of miss "Feels Thursday".